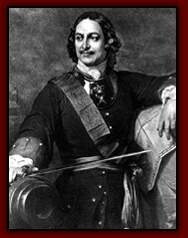 Peter the Great was born in 1672. Peter ruled with his brother until !682 when his brother died. From then on, he became the sole ruler of Russia. Peter was very tall and handsome and possessed an amazing strength. He is known as one of the tallest rulers in history, standing at a height of 6'8. He was also very simple and wore clothes that a typical tsar would not wear. At times he could make cruel jokes and drink heavily. While this is true, he was also very imaginative and open to new ideas. 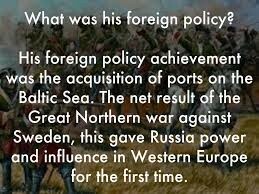 Peter the Great is widely recognized for his many great accomplishments. Peter The Great is mostly recognized for the revolution of Russia. While all of Europe was going through a great revolution, Russia was not. Because of Peter the Great, Russia went through it's own revolution allowing the country to catch up with the rest of the world in arts, sciene]ce and many other areas. In the battle against the Turks in 1695 he fought as regular foot soldier believing that was the only way to beat the Turks. He married twice and had 11 children, many of whom died in infancy. The eldest son from his first marriage, Czarevich Alexei, was convicted of high treason by his father and secretly executed in 1718.